From walking tours, to trolleys, and horse drawn carriages there is something for everyone! A tour is always a fantastic way to get to know one of the south’s oldest cities. Let an experienced guide fill you in on old Savannah lore while you take in all the sights. Who knows what all you get to see? Have a taste for the paranormal? Be sure to experience a ghost tour, and learn all about Savannah’s haunted history. 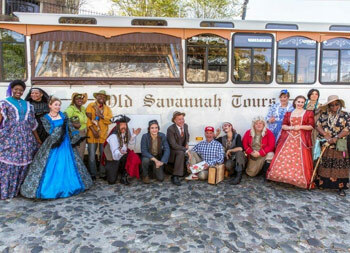 Trolley tours in Savannah, by Old Savannah Tours. Voted Best Trolley Tour every year since 2003! Call today 1-800-517-9007 or order online. Blue Orb Savannah Ghost Tours are also recognized locally as the best ghost tour in Savannah, Georgia. Carriage Ride Service, Longtime company offering history & ghost tours of the city by horse-drawn carriage. Ghost City Tours uses the best tour guides in Savannah to craft together a mysterious and exciting journey into the most famous haunted locations in old Savannah. Historic Savannah Hop-On, Hop-Off - Oglethorpe Gray Line Tours - The BLUE ... in stately Savannah; Enjoy a ride through Savannah on our iconic Blue Trolley. If your school or organization is considering group travel, a Kelly Tours group travel specialist will be happy to give a presentation highlighting the trip or trips that are of interest to you. Experience our beautiful city by horse drawn carriage. We offer you the best of touring experiences, keeping your special interests in mind. Old Town Trolley offers a variety Savannah tours including hop on hop off sightseeing tours, ghost tours, private tour charters, and Paula Deen tours. The Plantation Carriage Co. is Savannah Georgia's premier source for horse-drawn transport for tours around the historic district of Savannah Georgia and also for weddings and other special occasions. Explore the "Real Savannah" with a Savannah Native and maximum of only 8 special guests! Savannah Ghost Show, the family-friendly ghost tour™, was creatively designed to combine history from the spooky side of Savannah with an interactive experience for all ages. Take a tour with THE ORIGINAL and THE BEST IN TOWN! We are located in the historic district of Savannah, Georgia. Since 1995, we’ve been offering the best ghost tours in Savannah. Ghost tours and historic cemetery tours that are a cut above the rest. See Savannah, GA like you never have before with the Savannah Helicopter Tours; these family-friendly helicopter adventures are great for amateurs and experts, and everything in between.